You don’t need mountains to ski, and you don’t need to ski to enjoy the mountains. 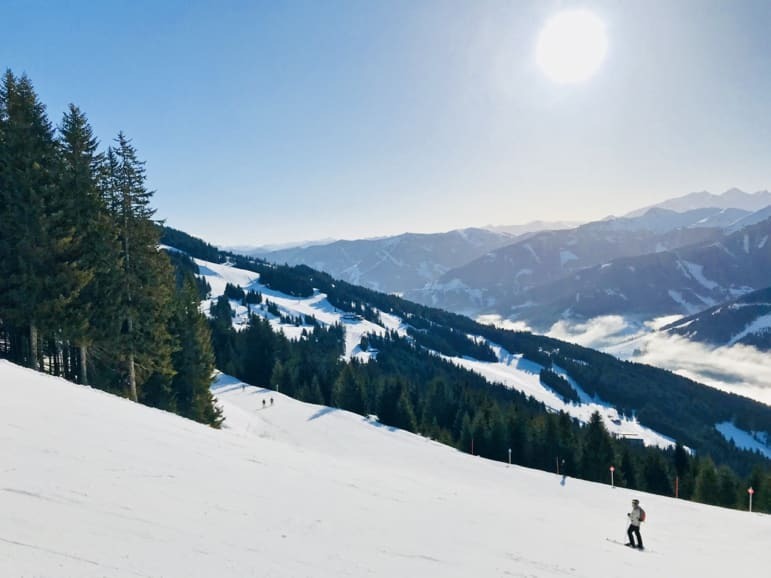 The Skicircus – Saalbach-Hinterglemm, Leogang and Fieberbrunn in Austria were set to introduce us to all manner of snow-bound adventures. From Alpine to cross-country, slaloms to fun parks, it’s a destination for every ski-lover. We were ready for our very own Skicircus challenge. Skiing has always been about downhill to me. On our first day in Skicircus though, I was introduced to life on skis in the valley – for me this would make for an entirely different kind of Skicircus challenge! 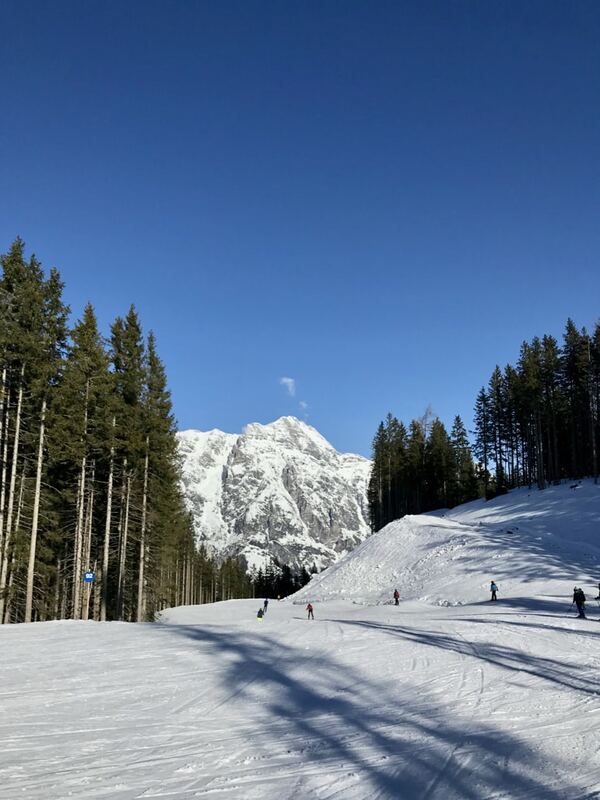 New for 2017 in Leogang and internationally known as the Nordic Centre of Excellence, this area offers a whole host of off-piste activities at Lake Ritzensee. With approximately 150 kilometres of cross-country trails to explore with varying levels of difficulty, it is a charming landscape in which to learn the craft. There is a beautifully prepared cross-country racetrack that is 4.7 kilometres in length, winding its way through a forest, this is more suited for professionals. But there is also a fun and snow park within the Nordic Park, which is perfect for children and their parents to practice cross-country skiing in a playful way. 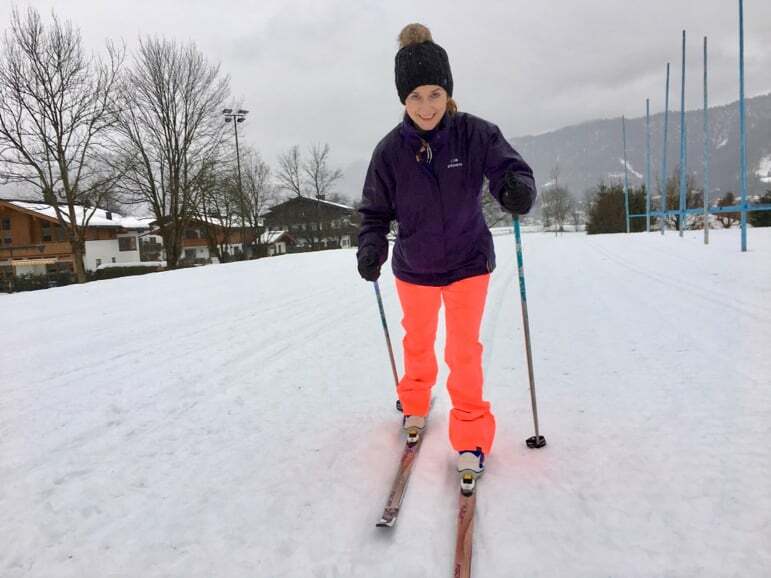 Sarah joined me for skiing this time and we met our teacher Andrea Grossegger to try our hand at classic cross-country skiing at the Nordic Park. Apparently classic is the easier discipline to master as you propel yourself forward in a striding motion. The alternative style – one you will see many experts adopt – is skate skiing, moving from side-to-side in a skating motion, something we imagine is pretty difficult with extraordinarily long pieces of wood attached to your feet. Our first impressions? We were like Bambi on ice! We didn’t love the fact that we were only clipped into the skis by our toes but how else could you propel yourself across the flat terrain. Andrea was very patient and we did some exercises before we learnt how to double pole and glide. The double pole was the easiest to master and but the glide, akin to running with the skis, was a little trickier. You need to have more trust in the skis that you are not going to fall over, which we are sure will come with practice but would take much longer than the hour we had to try it out. Cross-country skiing is a great work out and calorie burner so provides different fitness regime for those living in snowy climes. Amateurs will ski for five kilometres or more at a time, but for professionals, it could be upwards of 50 kilometres. Andrea also advised us that cross-country skiing is good for keeping parts of the female anatomy pert, and we were sold! How do we sign up for this at home? For those of us that live in the UK where snow isn’t readily available, it is not entirely out of the question. You simply need to adapt and try your hand at roller-skiing, which also comes in the two styles of classic and skate. 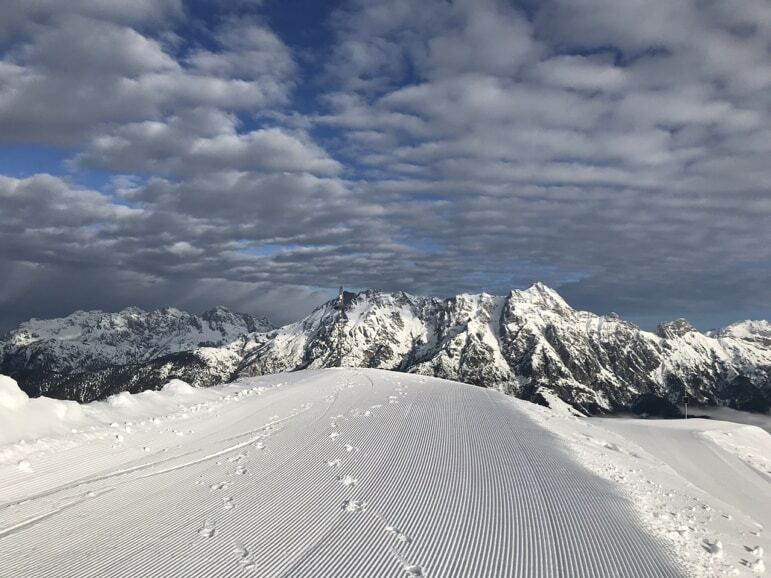 If skiing of any kind is not for you, or you simply want to experience something different you can go walking in the region’s winter wonderland. There are three distinct trails of varying lengths in the Nordic Park which will take you through snow-covered forests and alongside frozen lakes. The Skicircus challenge, are you ready for 270 kilometres of slopes? Waking up to heavy rain and cloud hanging low over the mountains before our hotel was a bit of a damp squib. But often when it rains in the valley it can only mean one thing – snow on the mountain and lots of it, and Skicircus did not disappoint. As we took the Asitzbahn lift up from the base station in Leogang, we were soon in dense cloud, but chinks of blue sky provided us with hope. And soon we were bursting through the grey and into the most extraordinary amphitheatre of winter fun. White mountains pierced the blue sky, the snow on them shimmering in the sunshine as we rose higher and higher away from the bank of cloud. The view of the Leoganger Steinberge range is simply the most majestic I’ve ever seen and I’ve seen many lovely mountain views. This was set to be a perfect day in the Alps, and after a day in the valley, it felt great to be back. My guide Marije was to show us around Skicircus, which has more than 270 kilometres of pistes to explore, all of which are linked making it one of the largest linked skiing areas in Austria. For those of you that love to test yourself, why not take on the Skicircus challenge? It comprises of 72 kilometres, 32 lifts and is approximately 12,500 metres in height and marketed as “ski your limit”. It is suggested that it takes seven hours to ski. You can even challenge yourself against others, by loading your lift pass on Skiline, with the chance to win one of three prizes. 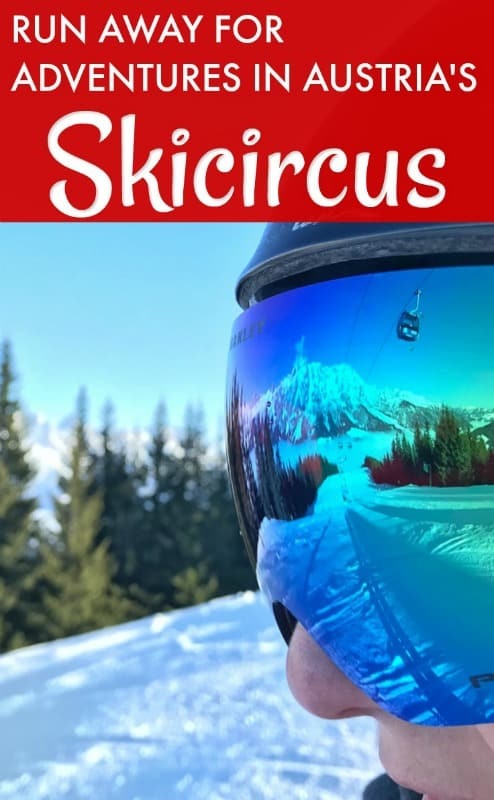 If you’re not up for the full Skicircus challenge though, you could try a mix of mini circuits, there are four other suggested itineraries that will take you around each of the skiing areas. 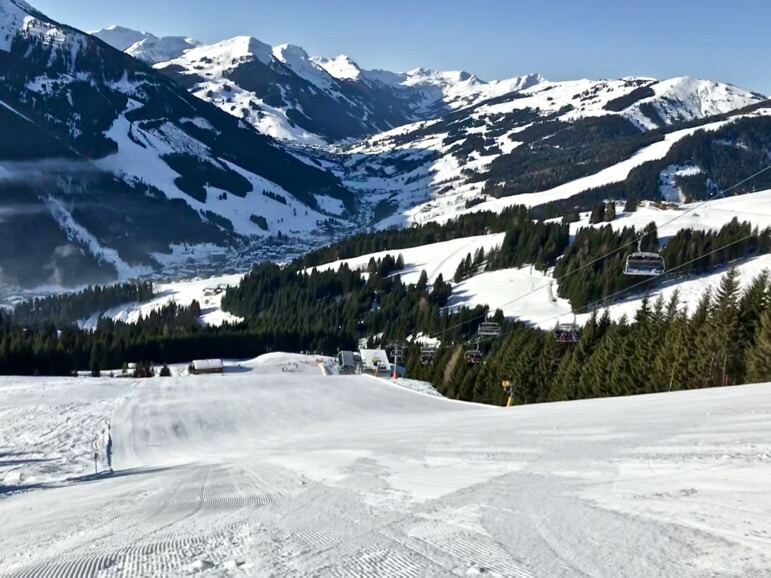 Skiing around Leogang and into Saalbach is predominately on blue and red runs – cruisey and wide – so well suited to beginners and intermediates. 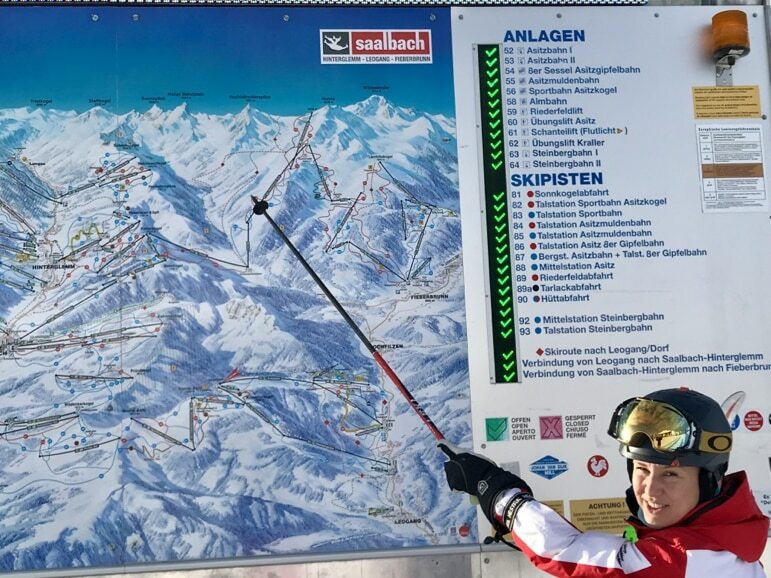 If you go across to Saalbach and onto the Schattberg peaks or over to the ZwolferKogel in Hinterglemm you will find some more challenging runs with black pistes, including number 15, the Welcup-Abfahrt, a world cup piste. Fieberbrunn, just over the border from Salzburgerland, in Tirol, is a mecca for freeriders. Those that want to venture off-piste have several ski routes and other off-piste options to choose from. What are you waiting for? Unleash that inner powder hound. 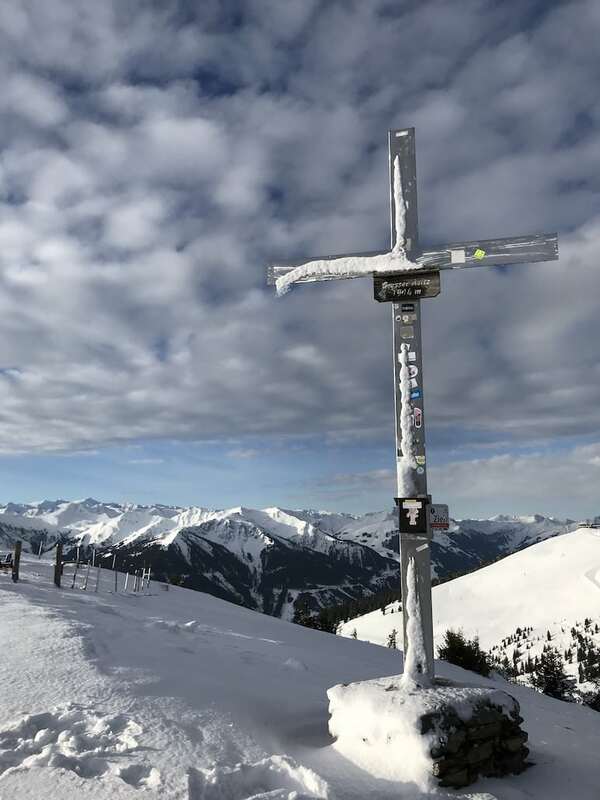 The area is also home to the Freeride World Tour which is held on the Wildseeloder mountain in early March, which is well worth a watch from the Lärchfilzkogel if you can line up the dates. 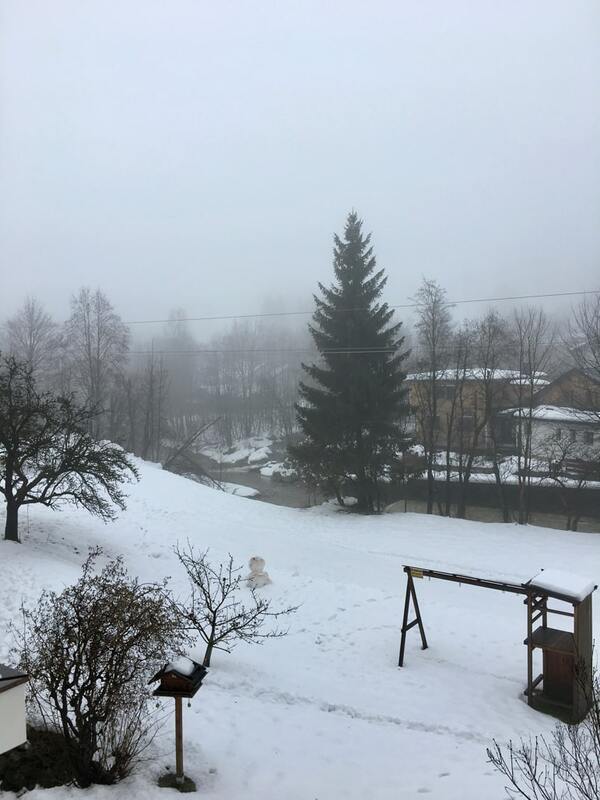 Whilst it is a fairly low lying resort, the snow record in Fieberbrunn is exemplary thanks to its own microclimate, known as the Schnee-Loch (snow hole). This delivers an average of 4.8 metres of snow each winter. 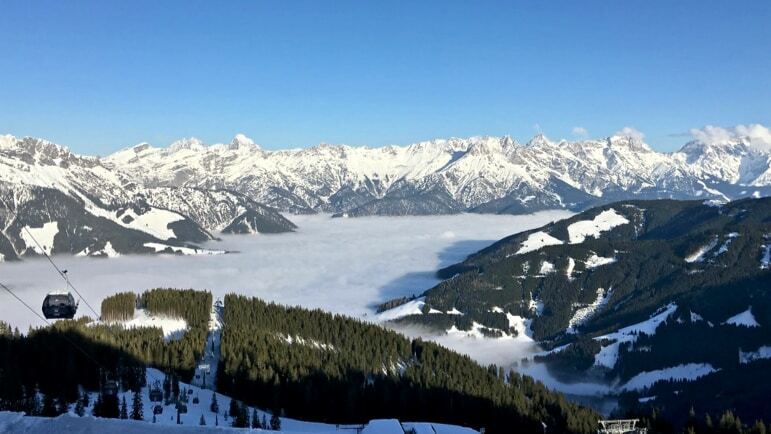 Fieberbrunn is fairly quiet in comparison to its neighbours in Saalbach, and those who’ve discovered it won’t want us to let the cat out of the bag, but you may want to give it some serious consideration. 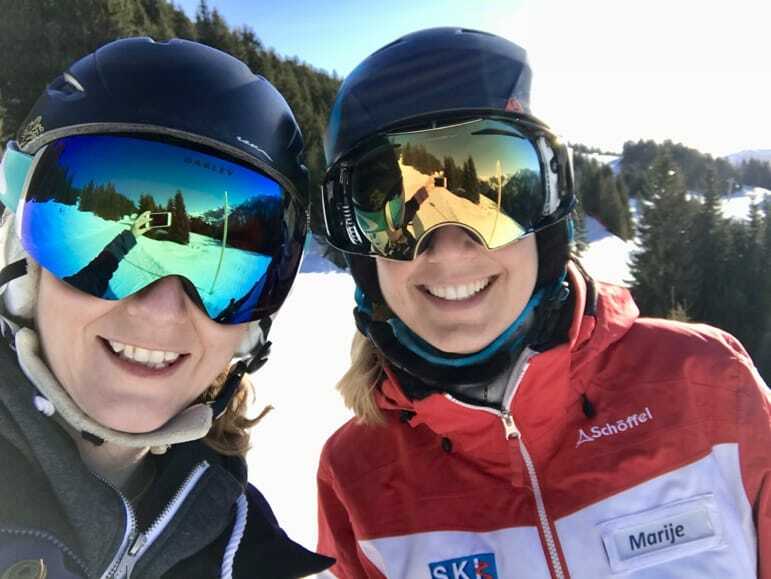 Aside from the blue skies and endless sunshine during my time in the Skicircus, the conditions were great and I had a lot of fun shooting down slopes and carving the bends with Marije, who took me to runs I’d never skied before. For those that want to try a few tricks in the park, there are many to choose from. The ‘learn to ride park’ at the Bernkogel, is more suited to beginners. Then there is a fun slope that features kickers and waves, located near the Hochalm chair. The Night Park in Hinterglemm is flood-lit from Monday to Saturday until 9.30pm and is suited to all levels. The Nitro Park in Leogang near the Asitzmuldenbahn chairlift features many obstacles that will help you improve as a rider. There is a GoPro bag jump which helps you tackle new jumps with confidence and the Freeride Park combines deep snow with jumps and obstacles. Maintaining the thrill of adventure, from early March adrenaline junkies can take a ride on the Flying Fox XXL – a 130km/h downhill ride on a 1.6km zipline. Thankfully, for me, we were there in January, so unable to try it out. The Home of Lässig as the Skicircus is known, translates as Home of Cool and the Skicircus really is the coolest ski area in the Alps evidenced by the four diverse ski areas. 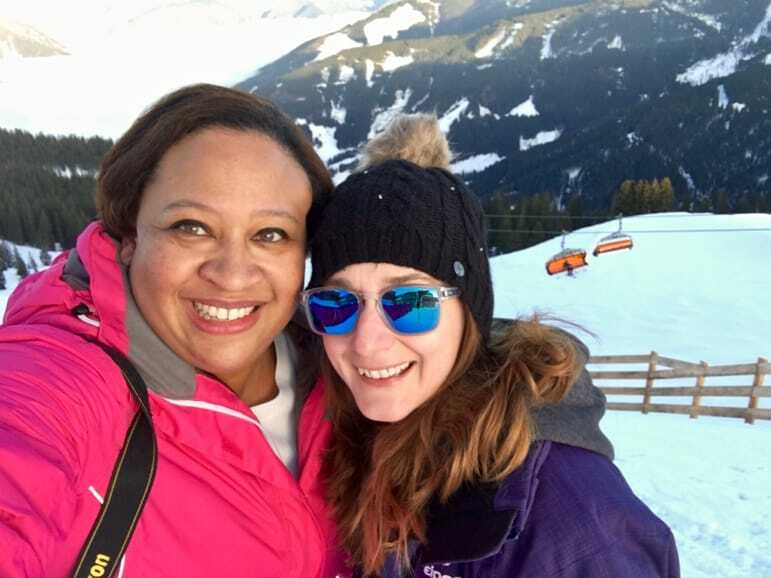 We found mountain dining in Leogang to be uber-cool especially at the Hendl Fisherei at the top of the Steinbergbahn, with its laidback Ibiza vibes that echo out across the mountain, you can relax on its sun-terrace and soak in the rays. 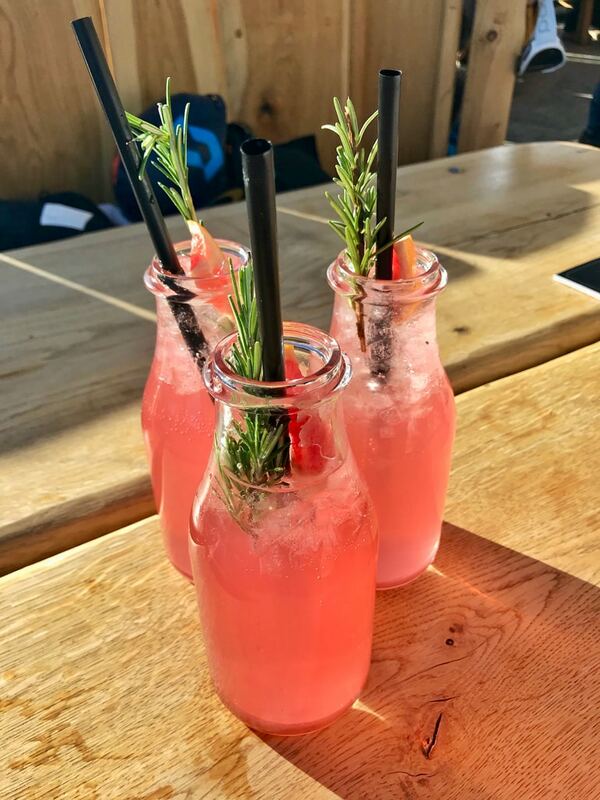 Its chicken is famed as the best in Salzburgerland but for the vegetarians, its hearty salad is also delicious, especially when washed down with their homemade pink grapefruit lemonade. 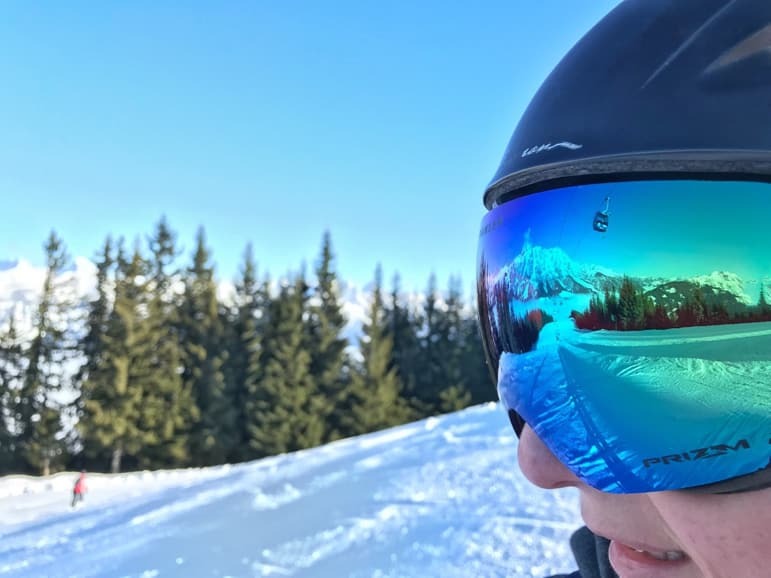 If you have non-skiers in your group, this is the perfect place to meet for a lunch stop as pedestrian access is easy, and it allows them to share the memories and the views that you get in the mountains. The huts in the Skicircus are just as distinct as the skiing, Leogang even has its own brewery, the Asitz Bräu, also at the top of the cable car. For a different Ibiza vibe and a party atmosphere, you should head to the Walleggalm or Goaßstall in Hinterglemm. But with more than 60 ski huts to choose from, if you’re looking for something modern and cool, or more traditional and local, your taste buds won’t be disappointed. Marije also talked about the Nostalgia Ski World Cup Championships which takes place at the end of January each year. Over 250 participants take part from six nations using old wooden skis, the oldest of which originate from before 1935. 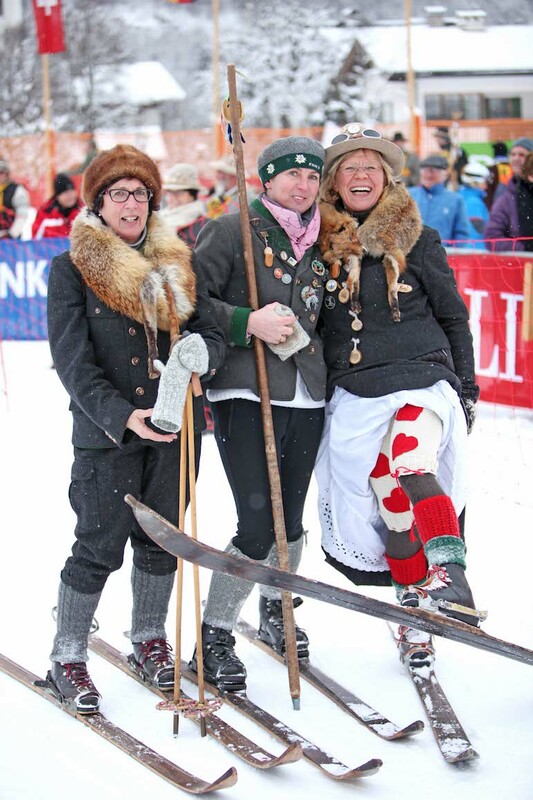 Participants also dress in period costume for the occasion in a fun event where they demonstrate their capabilities and acrobatics on traditional style skis. I wasn’t sure I could ski on old wooden skis, but I would use as my own personal Skicircus challenge and an excuse to go back to there again. Everywhere looks great in the sunshine and the blue skies did make for a beautiful day in the region. But with so much to do there for winter sports fanatics like me, Skicircus really has won its moniker and showed us just how cool an area it is. It has quickly become one of my favourite places to ski, not just in Austria, but anywhere in the world. And I’ve found that the real Skicircus challenge is finding time to fit all of its adventures in. There are so many great luxury hotels in Austria that you can choose from and the Saalbach-Hinterglemm, Leogang and Fieberbrunn areas are no exception. You can search for a hotel in the area below. 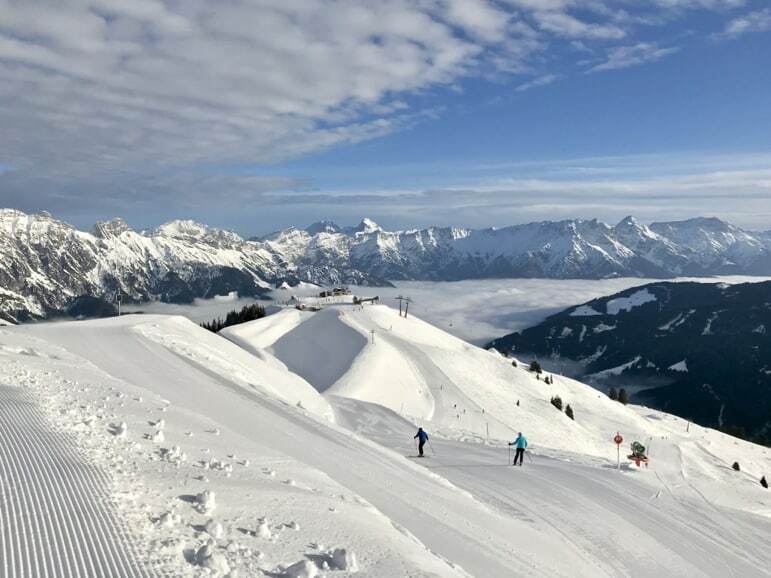 Look out for our next Austrian ski resort guide – we’re heading down the road to Zell am See-Kaprun for a mountain, lake and city escape, plus find ways to save on a luxury Austrian ski break with these top tips. This Skicircus ski resort guide is the result of a project with Austrian Tourism – as always, all thoughts are our own.